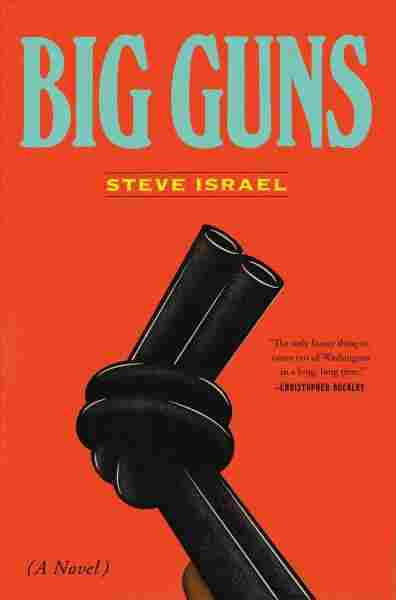 A Bill To Make Every American Bear Arms, In The Novel 'Big Guns' Steve Israel's new satire imagines a world where the gun lobby holds enough sway to pass such legislation through Congress. As a former Democratic congressman, he knows the subject intimately. Guns and gun violence are all over the news, especially after the massive demonstrations led by the teens who survived the shooting at their high school in Parkland, Fla., in February. The teens are insisting that this time will be different from previous violent attacks in the U.S. where much was promised and little changed. But if a bracing new satire by a former congressman is to be believed, maybe not. A new novel called Big Guns is set in a fictional town on Long Island that becomes ground zero for a pitched battle over gun rights and gun control. Its author, Democrat Steve Israel, represented New York's 3rd Congressional District until he decided not to run again in 2016. "He's one of the largest gun manufacturers in America and he decides that instead of constantly going on defense when there's a horrible mass shooting, that he's going to go on offense," Israel says. "And what's the offense? He's going to use the gun lobby to pass a bill in Congress that mandates that every American must own and carry a gun — with common-sense exceptions for minors under the age of 7." 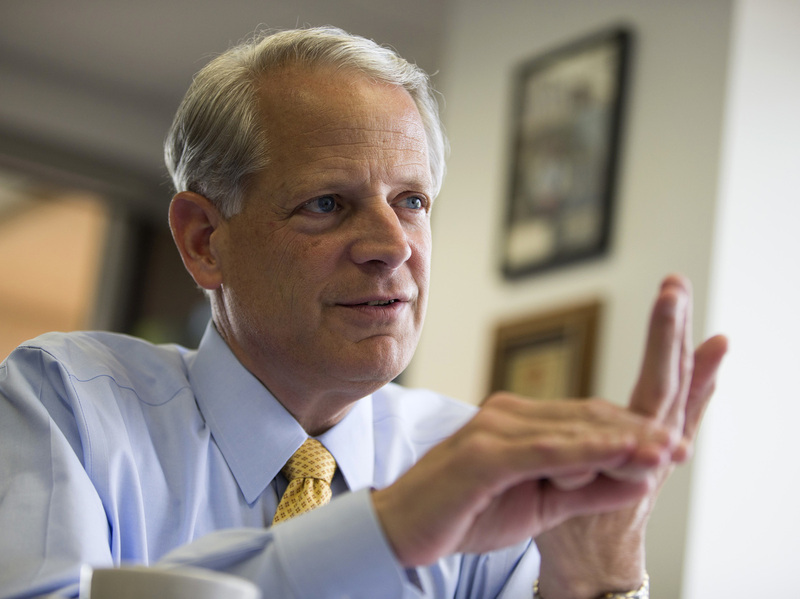 Former Rep. Steve Israel, D-N.Y., served in Congress from 2001-2017. He is pictured here in 2014. I'm sorry to tell you, it's based on fact. After Sandy Hook, after that shooting, the small city of Nelson, Ga., decided to pass a city ordinance that required that every resident carry a gun. And I decided to take that kernel of truth and embellish it, and apply that to the United States Congress and a president of the United States who are more fearful of the gun lobby than they are of gun violence in their own districts and communities. There's a common belief that the gun lobby pumps tons of money into the campaigns of candidates — it's really not that. It's the intensity of so-called gun voters. I remember talking to my colleagues after they voted against sensible things like "No Fly, No Buy" which says that if you aren't allowed on an airplane you shouldn't be able to get a military-style assault weapon. Or they voted against additional funding for research of gun violence. And when we went onto the members-only elevator — which is one of the few places where you can speak confidentially to your colleagues — they would tell me they were ashamed of their votes. And I would say: Well, why did you vote against those things? And the answer was: I can't go home to my district and face those NRA voters who will not forgive me for those votes. And that's why we're in the mess we're in. The fact of the matter is that the United States Congress has had opportunities to act to reduce gun violence. And on each and every occasion it hasn't. The No. 1 most-asked question in America after a mass shooting is: When will Congress do something? ... And the most honest way I could answer the question is to expose the truth with satire. Now, I could have done, I guess, a dry policy book explaining voter intensity among gun voters versus non-gun voters. But, you know, other than my mom I don't know that anybody would have bought that book. So after the Las Vegas shooting I actually did a piece for The New York Times that the Times headlined: "Nothing Will Change [After the Las Vegas Shooting]". And I explained why Congress will not act. Now, since Parkland, I'm a little bit more hopeful, but my hopeful is tempered by 16 years of witnessing some of the reasons to be cynical. And the point for these children and these kids is this: It's very important to march — and I spoke at one of the marches — but they've got to march to the right places. They've got to go into ... the most competitive congressional districts in the country in the upcoming midterm where you have a pro-NRA incumbent who's being challenged by somebody who will take on the gun lobby. There are about 15 of those districts. So my point is: You can have hope, but you've got to be strategic, and you've got to be savvy. And we need to go into those districts, make the phone calls, knock on doors, make the case. Because if we can only win five of those 15 districts, that will make a change in Congress. And what do I mean by that? There is nothing more elucidating to a member of Congress than seeing his or her colleagues lose to an ideology. And when that happens — when they see members of Congress losing their election — you will not be surprised at how quickly those who remain in Congress change their positions. Matthew Schwartz and Rachel Gotbaum produced and edited this interview for broadcast. Patrick Jarenwattananon and Beth Novey adapted it for the Web.